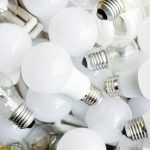 What is Low Voltage Lighting and What are the Advantages? Tiffany Lamps: Where Did it all Begin? It’s that wonderful time of year where the days are hot and the evenings balmy – in other words, patio season is here. 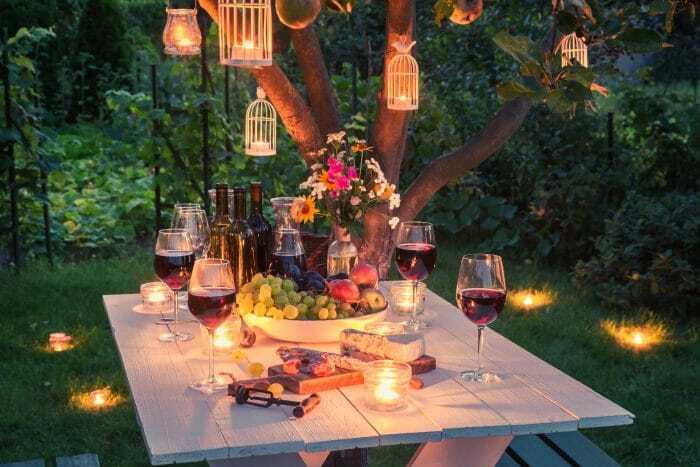 The long, light summer evenings and warm weather make relaxing out on the patio or decking a highly enjoyable treat, and the right lighting helps set the mood and keep the evening alive when the sun eventually slips below the horizon. 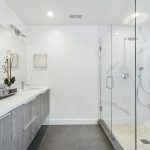 Not sure where to start or which lights to choose? We’ve got five great garden patio lighting ideas to help you achieve the perfect level of lighting in your summer garden. And it’s much easier (and much more fun) than you might think. Overhead party-style lights are perfect if you’re planning BBQ parties or simply want to create a grotto-like aesthetic for your patio. Party lights, also known as carnival and festoon lights are incredibly easy to work with, often consisting of a length of cable lined with retro-style bulbs, but you can choose all kinds of fairy light and string light designs to suit your taste. You can line fences and walls with party lights, but hanging them overhead can create an even better party atmosphere while providing great levels of functional lighting as well as decoration. Try stringing them from two high points such as posts, walls, trees and poles, or thread them underneath parasols and gazebo support structures to achieve your desired effect. 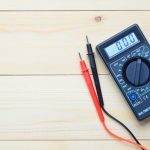 And, the great thing about string lights is that they are easy to power; you can get battery powered, solar powered and plug-and-play formats, all of which you can easily install yourself without the need for an electrician or complex wiring. Subtle wall lighting is the perfect way to go if your patio is surrounded by high or low walls, particularly if you’re short of floor space and other adornable features. Depending on the level of light you need, wall lights can flood your patio with bright light or add accented lifts at key points to set a serene, calming mood. The great thing about garden wall lights is that they are available in all types, shapes and sizes. You can embed patio spotlights or bar lights within your walls or mount lantern lights and sconces on brackets and plates to achieve your desired effect. LED wall lights are perfect for this function, as they use very low voltage, can withstand all weathers and are easy to install. Choose your style carefully to ensure your garden wall lights match the style and aesthetic of your garden, whether it be sleek and contemporary or rustic and traditional. Lanterns are the ideal choice if you’re looking for patio lights ideas that don’t rely on electricity. You can hang glass and wire lanterns from trees, wall hooks and fences or simply sit them on tables or on the floor, meaning you can adjust your lighting levels and positions as and when you need to. Simply fill them with real candles or battery LED imitation candles and watch them add a comforting glow to your patio or decking area. 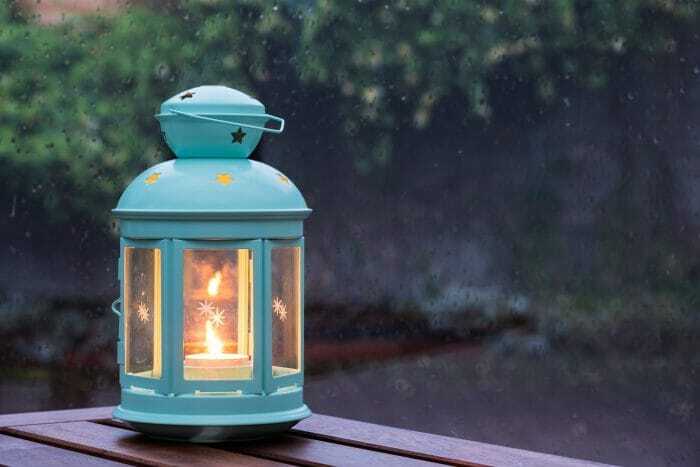 As well as the functional and hassle-free lighting option they provide, nobody can deny that lanterns also bring a certain magical light quality to any garden area. Try placing a few here and there and create your very own enchanted garden in seconds. Have you considered adding a fire pit, chimney or log burner to your patio area? If you’re a fan of the natural light route and want the added advantage of a little extra warmth on the cooler evenings, an outdoor fireplace might just be the answer. 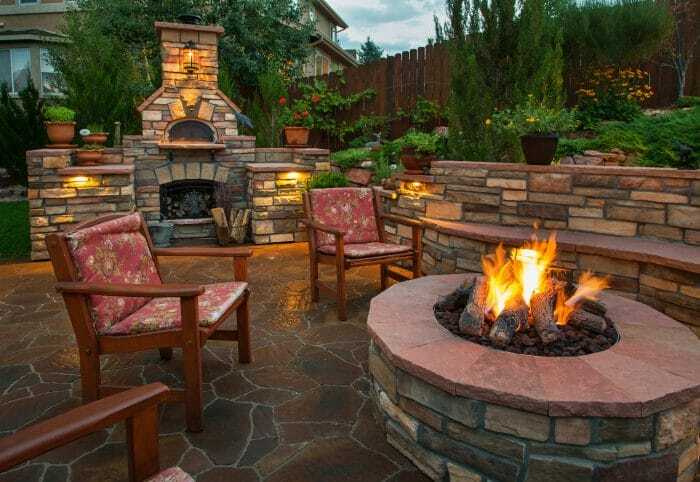 Outdoor fires can also be placed absolutely anywhere, which eliminates concerns about complex wiring and installation issues traditionally associated with electric lighting. Depending on your handy skills, you can build your own natural fuel-burning fire pit or simply install a self-contained outdoor fireplace or burner to fill your patio with warmth, light and decorative ambience. What’s more, with a fire pit you don’t have to restrict your patio evenings to just the summer months, as the added warmth means you can brave autumn and even winter evenings if you add a few extra clothing layers. Floor uplights are among the most popular outdoor lighting solutions for patios and decking areas due to their inconspicuous presence and contemporary look. 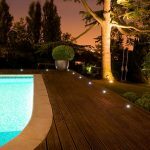 Safely embedded into the floor or decking, floor uplighters and ground spots don’t take up any space on your patio, while the LED bulbs use only very low voltages and can withstand all weathers, making them very cost-effective and long-lasting. 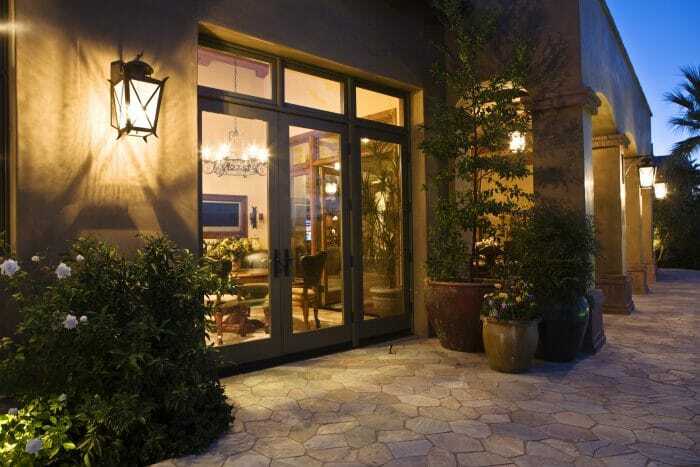 The only downside to these types of patio lights is that they are a little trickier to install if you’re not DIY-minded, so you may need a little help here. 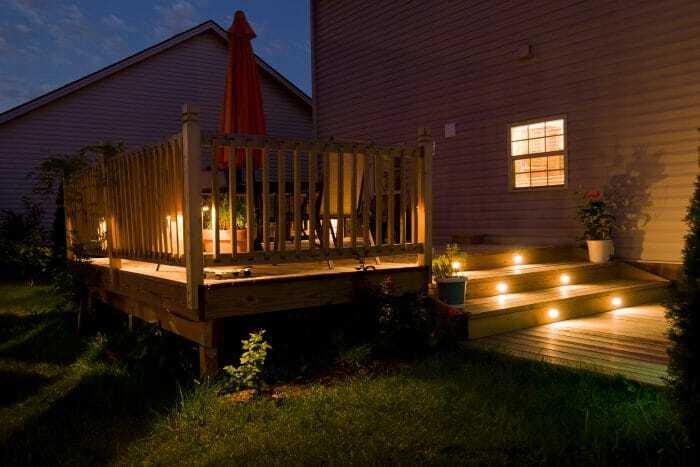 But once they’re up and running they’re there to stay, adding attractive mood lighting and additional safety for any patio or decking areas with steps or multiple levels. 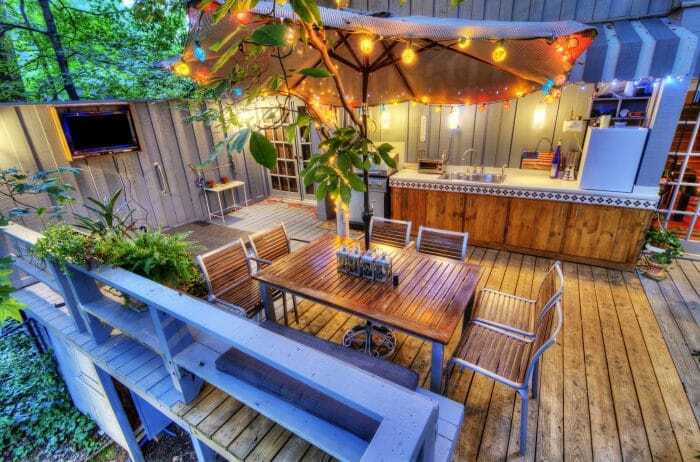 We hope that’s given you plenty of garden patio lighting ideas to try for your outdoor space this summer and beyond. If you need advice on choosing or installing outdoor lighting for your patio, simply get in touch with us by calling 020 8925 8639 and we’ll be more than happy to help.